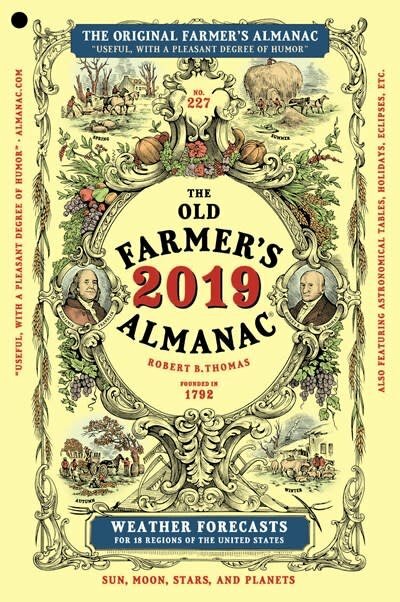 It’s another new year celebrating everything under the Sun, including the Moon, with The Old Farmer’s Almanac, America’s oldest continuously published periodical! Always timely, topical, and distinctively “useful, with a pleasant degree of humor,” the Almanac has been beloved for centuries by people from all walks of life. As the nation’s iconic calendar, the 2019 edition will forecast cultural, culinary, and other life-changing trends; preview notable astronomical events; provide time- and money-saving tips for gardeners of all varieties; set the hook for best fishing days; forecast traditionally 80 percent–accurate weather; and cover a range of related topics, including anniversaries, folklore, husbandry, home remedies, recipes, amusement, contests, and more—too much more to mention—all in the inimitable way it has done since 1792.